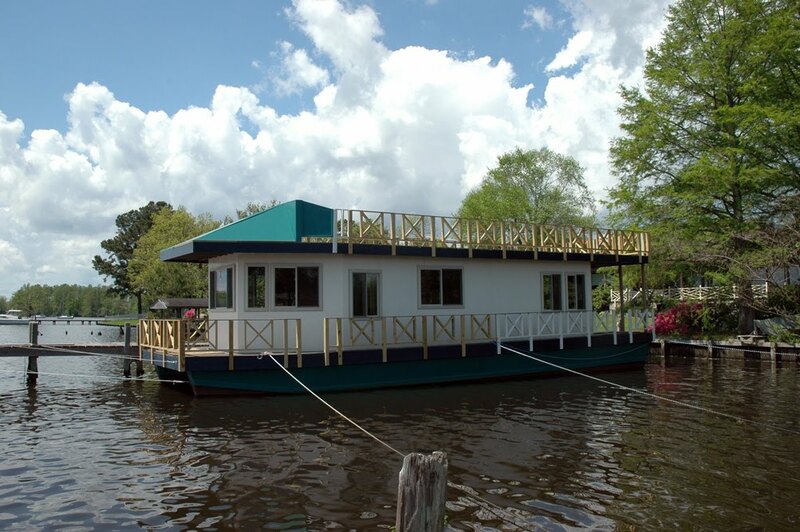 How do you build a houseboat? Do complicated mathematical computations, research what everybody else has ever done, talk to lots of experts, hire a naval architect, draft an elegant and complete set of drawings, compile a lengthy list of parts, pieces, and potential purchases, draw up a detailed timeline, and within a few months of flawless construction, hang curtains in the windows, purchase a bottle of decent champagne, and launch the resulting yacht for its triumphant shakedown cruise. Plan B, the No-Plans Plan: Get a sheet of quarter-inch plywood, and cut-and-glue until you have something that looks like a 1:12 scale version of the boat you had in mind. Hang a little radio-controlled outboard motor on the back, and see if the thing can be steered in the backyard pond. If you like the way that goes, use it as a pattern, and scale it up. Well, how about that? It works! Tracks just beautifully, even with a stiff crosswind and choppy water. We hope the real thing will do as well. The finished product will be 50 feet long, 16 feet wide, 14 feet from waterline to the top of the upper deck’s railing, and projected draft will be about 21 inches- just right for these shoally Carolina waters. The flat-bottomed catamaran pontoons should have a hull speed of about 9 knots, and according to the formula Rob is using, will require a couple of 4-stroke 40hp outboards, but we’ll probably spring for bigger ones to have some reserve power. The no-plans plan is to build the hull in easily transported sections, which then can be fastened together in the water, and finally, build the ‘house’ part on top. We don’t suppose our dear neighbors would be very happy to have a project this size underway in the front yard, so we’re building the pontoons in the garage, one 8-foot-long segment at a time. Think of them as trapezoidal plywood barrels. One of the joys of living in a town with top-flight boat builders is the ease of obtaining materials and the wealth of information available. The accommodating folk at Albemarle Boats just down the road are selling us the 4x8 sheets of Greenwood 3/4” CCA treated plywood. We’ve found expert and highly practical advice from a wooden boat builder in town, and lots of amused commentary from everybody who ever owned a pair of Topsiders. There will be twelve segments in all, the first and last on each pontoon given, at least some thought to hydrodynamics. The plywood is assembled over a treated 2x6 frame with 3M 5200 marine adhesive and stainless steel screws. Any place that two pieces of plywood meet is reinforced with two-inch stock. Hoping to avoid the hassles and expense of annual hauling, scraping, and painting the bottom, we’ve decided to sheath the bottom and lower half of the pontoons in copper, which involves sticking the copper roofing material onto the wood with the 5200 then fastening it with copper nails (also glued in) just to be sure. Our wooden boat expert advises that the part of the hull that won’t be underwater can just as well be painted with oil-based porch paint. It does look good on the first segments. As of 1 January 2005, the first two starboard pontoon segments have been painted, bolted together and are almost done. The first two port pontoon segments are cut out, assembled, and ready to have the copper glued on. Topping the ‘to-do’ list: Think of a name for this craft, (so far ‘Amish Clipper’- a tribute to our years in NE Ohio, and ‘Leviathan’ which, as the psalmist wrote, “he has made for the sport of it,” are on the short list,) settle on a design for the interior, and figure out how to fit it all onto the platform available. Rob remains confident that it will all fall into place as the need arises. On 5 January 2005 the first two segments were exposed to the light of day. It was an all day job for three of us to push the 1200 lb piece out of the garage, jack it up and onto a barely adequate boat trailer. It will wait there, under cover, until spring when we expect to have the opposite two connected segments done (plus, with luck, two more center segments) and our son, Bert, will be able to come help launch and bolt it all together. The week of March 7, 2005 found us only a little behind schedule. With Bert’s help, we were ready to launch by that weekend. An invitation to come watch- or participate in- the spectacle lured Rob’s brother, Philip, north from Charleston. With Sunday noon departure deadlines looming for our out-of-towners, preparations went on well into Saturday night. The first four segments were launched and bolted together by midnight. In Sunday’s early morning calm, we towed the joined pieces from the marina to our home dock. Stronger winds and a stalled outboard motor lent a little excitement at the end, but a heroic lunge by Philip saved the boat from any damage. She floats just at the level calculated (a bit down at the bow, of course) and had no leaks at the seams. On June 25, 2005 we were able to add two more sections, making six in all. Not quite half of the completed hull. The new segments were towed from the marina as before and fit together in the water with no trouble. We had one person in the water guiding and another in the boat to lift, clamp and drive bolts. The connecting bolts were driven through pre-drilled holes and matched perfectly. The clamping did start a significant leak in the second segment but this was easily patched. Each compartment has its own bilge pump for just such an eventuality (and because they are still open to rain). At present most of the 2x10 deck beams have been installed and the 2x12 gunwale boards fastened on the sides with ½ inch lag screws. Some deck plywood has been cut and fastened down but most is loose and moved where needed. Here it is, December 2005. Progress over the last few months has been …. subtle. You just have to know what you’re looking for. Despite steady picking away at it, the details make for very slow going. Deck hatches have been framed in on the first six pontoon sections, and electrical conduit now runs between each section. A second layer of plywood has been painstakingly cut, painted and fitted into place below the crosswise deck beams. This process involves paddling between the pontoons in a kayak, and screwing the plywood pieces in overhead. The most time-consuming task has been to fit a coaming between the underside of the deck and the top edges of the pontoons which protects the innards of the boat from splashing water. It requires measuring, cutting, trimming, trial and error, repeat as necessary, then sanding, and painting. Two more pontoon sections are now completed and were installed with the help of Bert and his friends over Christmas. That’s eight down, six to go. We’re not as far along as we thought we’d be by now, but this is a now-familiar refrain. It’s just as well. The joy, we hear, is in the journey. Spring break for March ‘06 arrived, and all the kids made it down to help out. We installed the rest of the deck beams, fastened the plywood on top, and cut in the hatches. Two more segments are in the final stages, copper sheets nearly all glued on, and it’s almost time to paint. Even though there are two more middle sections left to build, we were ready for a change, and jumped ahead to begin a stern segment. This one is more of a challenge. The aftmost three feet of this section is upswept 12 inches to reduce drag, and must accommodate an engine and a fuel tank. Planning the shape of the transom required visits to outboard motor salesmen, lengthy explanations of why and wherefore, and much discussion about how much power is enough for a boat this size. Short answer: Nobody ever saw a boat like ours before, so they don’t rightly know, but they’ll all be happy to sell us whatever we think we need. July 2006- Coastal NC temperature and humidity are both in the mid-90s, which makes for slow construction. We‘ve decided, looking at the expanse of deck so far, that a 50-foot boat should be enough for anybody. That means we’re now just two coats of paint away from launching the last two sections. Woohoo! Before long, it will be time to start on the house part. We’re planning to put the salon and galley aft, with easy access to a generous rear deck. The thought there is to shield ‘happy hour’ from the wind, while swinging on the hook in some peaceful backwater. The head and the only stateroom will be amidships, and the inside helm, forward–center, will have a convertible sofa/bed for keeping the skipper company on a rainy day, or accommodating whoever’s along for an overnight ride. September 2006 – The hull is finally out to full length, progress is being made on the main deck structure and we actually have our garage back. There has been one snag. We were hit by a pretty good not-quite-hurricane (TS Ernesto) which showed up a previously suspected weak spot and there has been some minor separation between the sections. Time out while I run threaded rods the full length of the boat to snug things back up and then add some longitudinal stiffening. This will probably take all month. December 2006 – OK, so two months. Everything is now nice and solid and the main deck is finished except for a bit of plywood. Now perhaps we can get serious about the deckhouse. Here’s the proposed floor plan, laid out on the deck in 2x4s. The green squares are hatches into each pontoon section. The head is planned to go in the bump-out to the right of the picture, with stairways up to the top deck from the starboard walkway both fore and aft of it. Small boy and his grandpa are in the space which will serve as both inside helm and second bedroom. The recliner is where the master stateroom will most likely be, and the salon/galley, with access to the rear deck and swim platform aft of that. January 2007 - Here goes the last bit of underdeck plywood. A little awkward to install from this position, lying crosswise on the little fishing boat, especially when it’s choppy. Rob thinks this space between the hulls would serve as a fine en-route ‘garage’ for the dinghy if it could be hoisted up snug against the underdeck somehow, but hasn’t yet worked out the details. For those who are more interested in the details, here is a shot of the interior structure of the main deck with the PVC pipes which will contain the engine controls. February 2007 – Well, friends, we have reached a significant milestone. Here is the completed hull and main deck. March 2007 - finally sees a start on the deckhouse. We made a trip to the Houseboat Show in Louisville to learn of many things we didn’t want and to find out that some people were doing things we had worried about and were making them work – Plus a few good ideas and information on where to buy them. April 2007 – This month has been pretty well used up by spring yard work and an excess of paying jobs. I expect more serious boat progress in May. July 2007 – Lately our progress has actually become visible to the naked eye! Framing is gratifyingly dramatic, with all the walls up, and a start on the exterior plywood. A stalwart crew showed up for the week of July 4, hoisting roof beams and toting heavy stuff. “I’ll be satisfied if we get enough of a top deck on to sit up there and watch the town’s fireworks,” said Bert, our #1 son and assistant boatwright. So he did, and had the best seat of all. Now that the water is warm, it’s time to install 2x6 stiffening rails along the top of the copper hull sheathing just above the waterline. November 2007 - Slow progress this fall, but the rough carpentry on the deckhouse, including the aft deck, is done and we are well started on the roof. This has been built up of 2x8 rafters, a series of longitudinal stringers of decreasing thickness so as to create a two inch crown to the roof, then topped with the same ¾ treated plywood used almost everywhere else on the boat. There is a 2x10 roof band, here seen installed and painted blue. All the roof joints will be bedded in 5200, then everything will be sealed with non-skid paint. February 2008 - Winter has not seen much photogenic progress, but the roof stringers and joint supports are all in place. The roof plywood has been trimmed, and just over half of it has been glued down. This has been slow, because each sheet needs to be glued down on a warm day that follows a dry day. Needless to say, warm dry days are in short supply around here this time of year. To see the upper deck all laid out is sort of impressive – looks like a lot of square feet of party deck. March 2008 - Spring’s here—we think. The birds are courting like crazy, the flowers are putting on quite a show, and a young man’s thoughts turn to…. Painting. We’ve begun to coat the exterior walls with the same industrial enamel we used on the hull, this a sort of cream color, which we hope will help keep us a bit cooler in our long summers. By doing that job now, we hope to avoid having to mask and do picky trim painting after the windows go in. The next job is to finish gluing the roof down, and build the second set of stairs aft of the bump-out. Conversations with various local marine suppliers about powering this craft go well, until we mention our hope that they’ll install the hydraulic steering apparatus as well as those heavy outboard motors, and do the whole job with the boat in the water. Then, they back away warily, promising to “get back to us.” We’re sure it’s possible, but once again, “ain’t nobody ever done it that way before.” That seems to worry some folk. July 2008 - Happy 4th of July! Today’s signal accomplishment was mounting the brass flagpole bracket our friends gave us. We fit it with a steel mop handle, and ad hoc lanyard, and installed Old Glory in preparation for our annual backyard picnic and fireworks-watching-party. This evening was such a lovely one, nice breeze and golden sunset, that we brought out table and chairs, and had supper on the boat for the first time tonight. Really a pleasant space. As usual, too much work and out-of-town travel distracted us from boat-building more than we’d planned, but we do have all the plywood glued down on the roof, and it seems satisfyingly watertight. Both forward and aft ladders are also now in place. They’ll be enclosed below the steps, with hatches accessible from dockside, to provide well-vented storage space for hoses, propane tanks, and so forth..Sanding and painting (and sanding and painting and sanding and painting) the bulkheads is about a third done. The first three sections of deck rail are painted and installed- That’s three down, and dozens yet to be built, but it’s kinda cute. 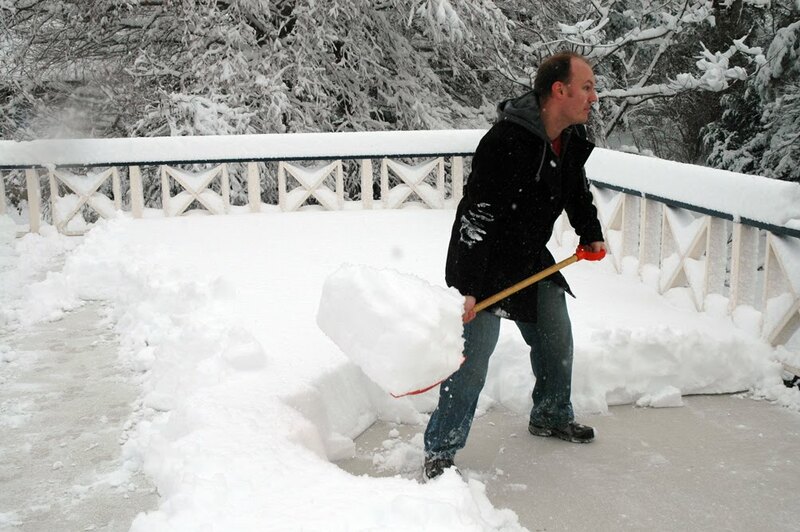 Still waiting for all those outboard-motor vendors to stop by and give us a real quote…. And waiting. November 2008 - Turns out there’s a lot of square footage to paint on this boat’s exterior, especially when it needs four or five coats of oil-based paint, sanded between each coat, and is apparently best accomplished with a 2-inch brush. But we’re almost finished with that part. It’s time to order windows this week, and when the weather’s decent again, we plan to apply waterproof non-skid-truck-bed-liner to the decks. The upper deck’s leading edge (whatever you call that) is now glued in place. November has brought cool rain and wind, which is perfect weather for hiding in a warm dry garage and building railing sections. Apparently it’s beginning to draw attention from even non-boaters, as a stringer for the local weekly paper came by a week or two ago, camera in hand, to find out what in the world was going on here. First thing we knew, there was a large photo of a grinning Rob and his boat, right there in full color, on the front page and above the fold, yet. Must have been a slow news week, but it was a nice article. December 2008 - Bert and friends were down for Christmas and we got the windows in – not quite weather-tight yet, but a major advance. Another half dozen segments of railing are assembled but will need to be painted and solidly installed before we can claim too much credit. It’s a good cold/rainy day occupation, and we have enough pieces yet to be constructed to use up a lot of bad weather. We are also now trying to figure out the electricity. Its installation will be another good winter project. For those of you who have never made sense out of the layout, or followed the changes, here is the floor plan, nautical nomenclature and all. The lines are the beams across the tops of the pontoons, below the deck, and show where ‘outside’ is. April 09 - After most of a winter spent constructing fence-rail sections, they’re temporarily installed around both main deck and upper deck—mostly unpainted, so the treated wood might dry straight. Next chore is to take them down two or three at a time to sand and paint them as time permits. Other chores included building a console, and beginning to close in the openings just below the eaves to discourage home-hunting sparrows. June 09 - The maiden voyage- a half-hour cruise up Pembroke Creek! Last week an energetic crew from Albemarle Boats came out and installed two Yamaha T-60 high thrust outboards, Teleflex steering cables, and the basic engine gauges and steering wheel on the boat. Budget constraints have caused a postponement of rigging the upper deck steering station, but the one inside will at least keep us out of the rain. Rob rigged up pulleys over the engine wells, and the men hoisted the engines into place without difficulty; they shoved the steering and electronic engine control cables through the PVC pipes that run just beneath the deck, and soon Rob’s mahogany helm sported digital instruments, massive binnacle, and a shiny stainless ship’s wheel. After two days of concerted effort, it was time to see what we had here. The weather gods smiled, providing a bright blue sky and a pleasant 5 knot breeze out of the west. A sizable contingent of Albemarle’s top brass showed up in a spiffy chaseboat, and the dock lines were cast off for the first time. Our departure looked like we were all pros at this, and the next test was to steer out to the middle of the creek and do turns, left, right, and backing up. As it turned out, the steering worked well, the boat turned easily in its own length, and was responsive enough for Albemarle’s engineer to admit being ‘very favorably impressed’ with its handling. Half throttle saw 7 knots forward speed just as predicted. As engine break-in progresses, we’ll ease all the way up to a blistering 9 knots, maybe. Photos taken by the chase boat revealed a tendency to plow, bow down, which we’ll correct on the next trip out with some up-trim and (we admit with slightly red face) making certain to pump a few hundred gallons of rainwater out of the front sections of hull. And we’ll also be sure to haul in those fenders. The view astern is nil, making backing into the slip a challenge, so next on the list of acquisitions is a couple of backup cameras or trailer mirrors. October 09 – Sanding and painting the Non-Skid surface on the top deck. RIP Old Website. After a long delay, we've finally gotten started on a new one. Bookmark us-- maybe this one will be around a while. December 09 – Robbie at the helm! The day after Christmas, we took the boat out for our first all-afternoon trip. It was a glorious, mild, calm, sunny day. We were blessed with a house full of family and friends, several of whom had lent an invaluable hand in building the thing, and a whole 12 gallons of gas. All we needed was a few extra life jackets and a picnic lunch. Suitably equipped, we cast off the dock lines, and headed up a glassy Albemarle Sound, churning away at most of 7 miles per hour. An hour later we passed beneath the Chowan River Bridge, made a grand U-turn, and headed home. Everybody got to take a turn at the wheel, and 5-year-old Robbie, in particular, steered as if he'd been at sea all his life. It was a fine trip, and even though a finished (and insulated!) interior is still some months in the future, all our passengers seemed to have a wonderful time. While recuperating from a painful back injury (and to think, we moved south, AWAY from snow and slippery ice) Rob is installing AC wiring for lights and wall plugs. He is still mulling over how to tackle the hull damage. The forward compartment is leaking like a sieve, and as the bilge pump can't keep up, we've disconnected it. Fortunately, there are still four more compartments on that side that are sound, and one more, that, although it's leaking, the bilge pump's keeping it fairly dry. The excellent people at Albemarle Boats have offered the use of their Travel-Lift, which is one of the few in the area big enough to handle this monster boat, but he is not sure yet that's the way to go. We may attempt to drop the damaged hull sections out from under the deck by flooding them completely, then once free of the boat, pumping them dry-ish, towing them back to the marina we launched them from, and hauling them out on a trailer. Then, according to the theory, we can repair them at home in a nice, warm garage. Should be a good show-- anybody want to buy tickets? March 2010 -We have an Internet friend who's a bloomin' genius. On hearing of our holed hull sections, he suggested a trick he used with wooden boats that had been on the hard all winter, and were thus dried out and leaky when they went in the water the following season. He suggested we nail a coffee can to a long board, then put sawdust in it, poke the board under the boat, turn the can rightside-up under the leaks so that the sawdust is drawn into the cracks, expands, and plugs the holes. Sawdust is a commodity we have in abundance, so we tried it the next nice day. Coupled with a few pieces of plywood screwed to the hull from the inside, it seems to work like a charm. The leaks have slowed to a bare seep, and now the bilge pumps keep up quite nicely. Looks as if we will still have to wait for swimming weather to fix the thing properly, but for now, it's a huge improvement. The installation of electrical wiring, wall switches and boxes for AC power proceeds. A solar-energy man stopped by the other day after his appearance at a local 'Green Fair' to talk about solar panel installation, so now we look forward to hearing his proposal. Finally it's time to do the definitive repairs to those storm-damaged port hull sections. We lured our son, Bert and his toddler all the way from St. Louis, to join us for the effort. The first task was to remove 56 rusty bolts fastening the forward two hull segments to the rest of the boat, then pry them down from the deck with jacks to make sure they were free of any bindings or attachments. Then we filled the loosened hull to the gunwales with water to float it out from under the deck. First snag: a brisk north wind brought very low water levels in the bay, not quite enough to get the pontoon pieces out from under. The next day's windshift solved that problem. Second, we weren't sure how much list this loss of buoyancy would theoretically cause, but the reality was obviously "too much". We propped the port side up with an improvised spud bar, and then constructed a 4x4x8 ft plywood box (about the size of an individual hull segment, but with a little more volume) flooded it, floated it under the deck and pumped it out which brought everything nicely back to level. The damaged hull sections are now back on the boat trailer, looking much like they did in the January 05 pictures near the beginning of the blog, at least on one side. The side that bounced off the rocks is obviously going to need work. That's the next challenge, and as usual, we'll be playing it by ear. Repairs are going slowly but it all looks possible. Even if we can't take the boat out we can still have some fun with it. We had our usual 4th-of-July party with our usual hundred or so best friends - the teenage set remains fascinated by the boat even in its current neglected state. Finally some real progress. Winter has been used to install electricity and finish the repair of the storm damaged segments ( the repair being to cut away and replace the damaged plywood, coat the entire submerged area in a monolayer of 5200 and replace all of the copper on the damaged segments (no stopping place found). So last week Bert and his boys came down the help put it all back together. Some of the local wildlife took a hopeful view of our safety arrangements but, perhaps due to the efforts of friends and local experts eventually went home hungry. Finally got everything working again and invited a few friends-- maybe 60 fellow members of Edenton Yacht Club-- over for a raft-up and boat-naming party. She is now officially the "Lotus Eater." Preparations for the raft-up included nailing cypress tongue-and-groove paneling to the interior studs, building walls around the head and installing a door, hanging some ceiling fans, and some general sprucing up. Party time arrived, and the lame, the halt, and the elderly- including us, came aboard at our dock, along with several cases of beverages. Able-bodied yachtsmen sailed their own boats after us. We tossed out the hook about a quarter-mile up the creek from home, and before long, pizzas were delivered by party-barge. It was a fine excuse for some long-overdue visible progress, and an excellent demonstration of this boat's flotation capacity. 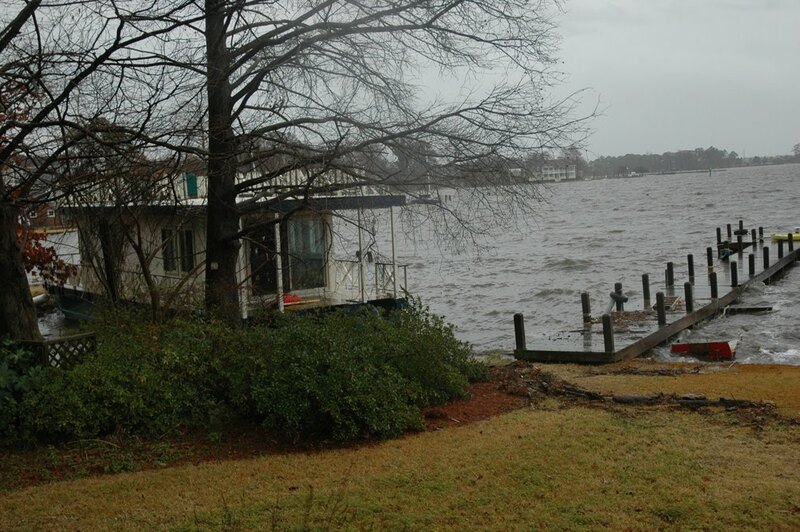 We had our first serious hurricane warning since we started to build the houseboat. The eye of Hurricane Irene, at one point a Cat 4 storm, was headed right for us. After considerable debate we decided to take the Lotus Eater up Filbert's creek (which is just a few hundred yards from our house) and closer to town. Waves and south wind from Hurricane Isabel, back in 2003, had destroyed a number of houses along that creek, though a neighbor's large sailboat moored there escaped undamaged. (The owner of the sailboat noted that boats are built to withstand high water. Houses, including his, not so much.) All that remains of one house is a concrete sea wall with three stout cleats. With the help of neighbors, we tied her off to the cleats and to three large cypress trees on the other side of the creek, set out the anchor, boarded up the house and flew the little airplane safely out of the storm's path, as terrible things happen to aircraft hull insurance deductibles if you stay put. The storm was not nearly as bad as had been predicted, the wind was mostly from the north, and the boat came through just fine. It will take a few days to get the yard cleaned up and we're missing a couple of shingles, but other than that, we had no damage. Now we get to figure out how to back out of there without bumping into anything expensive. 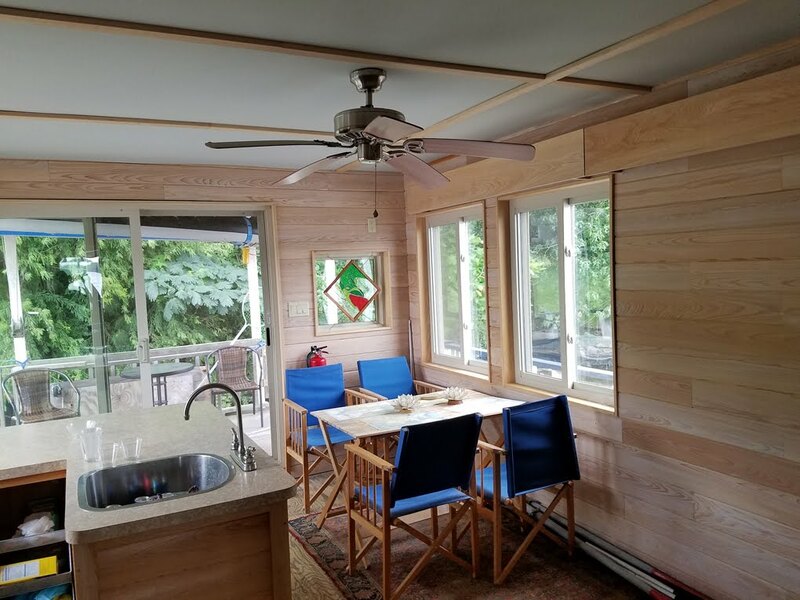 What construction we did this summer was mostly electricity and interior paneling. We did get her out a few times and found the newly-installed backup camera and depthfinder very helpful. We had our longest trip yet the first of this month. On a calm cool day we crossed the Albemarle Sound and into peaceful little Salmon Creek, where we anchored for lunch. 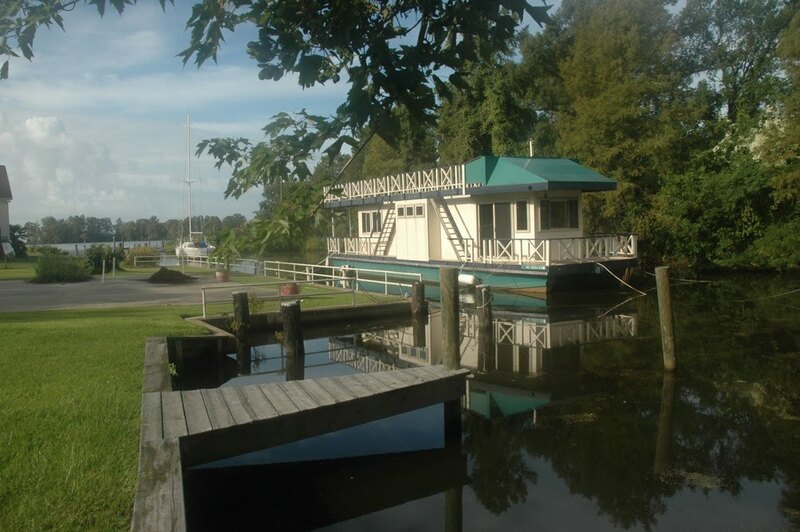 We admired picturesque old boats and winter swampland, then motored over to Wharf Landing on the other side of the Chowan river - 20 miles overall. Finally opened the engines up all the way and got her up to 8.9 mph - not quite the calculated 9 knots - may have to look into different props, if we care. At 2500 rpm (75% power) she does 6 mph and burns less than half the fuel - we figured that would be the utility speed all along. We just returned from our first real overnight trip! It would be camping at this stage of construction, but an improvement over tiny tent with bugs and tree roots. After watching the weather for weeks for two days of mild winds and quiet water, (and no pressing prior commitments) we found our opportunity. We cast off the dock lines by early afternoon, and headed to the fearsome Albemarle Sound and its pretty little ripples, and then proceeded up the mile-wide Chowan River at a stately 5.2 knots. Five hours later, we passed the swampy landmark, Holiday Island, and entered Bennett's Creek, a favorite anchorage for local cruisers. Today we had it almost to ourselves, passing one bass fisherman on the way up the twisty creek, lined on both sides with cypress trees and patches of yellow lotus. The late afternoon sun cast long shadows on the black water, and as soon as we'd set the hook in an idyllic deserted wide spot in the creek, we tossed a little kayak in the water, and went exploring. Domestic duties- like dinner- could wait. A lovely sunset ensued, and by wine-o'clock, all the stars in an unusually clear night sky had twins floating atop the glassy water. Unbelievable! The peace was disturbed only by one lonely screech owl who gave up after one mournful complaint. Not a time or place to run a noisy generator, so we gave in to campers' hours, set the anchor watch alarm on the iPad's GPS charting program, and turned in early. We were, thus, up at first light, in time to admire delicate pink mist rising off the mirror-like water. A bass-boater roared by, hurrying to catch the day's first fish. Time for breakfast and to head back five hours in the other direction. We learned some things: Air mattresses are cold! Must bring foam pad- and warmer attire- along next time. Really ought to investigate, buy, and install a house battery bank and inverter sufficient to at least briefly microwave a cup of coffee or two. The ad-hoc head arrangement was entirely too ad-hoc for practical use. The for-real, purpose-built composting head is tomorrow's purchase! We also found that our iPad, purchased for aviation use, works even better for marine navigation. With free NOAA nav charts and charting apps ranging from free to $50ish, we knew exactly where we were, how fast we were going, what and where our next mark would be. Learned that a hot shower will be a fine and welcome luxury, and the Plumber-in-Chief is now motivated to git-r-done. Totals: 50 miles traveled, average speed of 6 miles per hour at 2500rpm on the two 60HP outboards, and 22 gallons of fuel used, all told. Not bad, for such a memorable getaway. Slow progress continues. Most of the basic plumbing for the fresh water is in and a good start has been made on the shower and composting head. Nothing very photogenic except for the mounting of the name board. Mimi gave me this for my birthday. She designed it, a good friend (who does this as a retirement business - in case you need one) carved it and Mimi painted it. All looks very professional. Interesting day. We started out across the Albemarle Sound in a light breeze to have lunch at Mackey's Marina, about 7 miles due south by marked channel. Once out of Edenton Bay, the northeasterly wind picked up and the sound indulged in its notorious habit of becoming suddenly rough (some companies will not insure a boat used on these waters). We had never had her out among the whitecaps before. Waves were still less than three feet but it was enough to be glad that I had slotted in all the structural members and secured them with deck screws. We docked at Mackey's Crab Bar with minimal trouble (though with some dockside help from the proprietor), had a very nice lunch and collected some unexpected compliments on boat design and seamanship (the latter undeserved). The trip home was much more exciting. I don't think the sea state was that much worse but at the different angle she rolled alarmingly and we began to take water over the bow which flowed past the hatch covers, overwhelming the bilge pumps in each forward barrel. I don't think we were ever in any danger and now we know that she floats well and is reasonably controllable even with the first two hull segments full of water. The wind was nice enough to die down once we got back into Edenton Bay and we got back into our own dock without having to re-paint anything (my criterion for a successful trip). Need to think about those hatch covers. Almost all of the interior cypress paneling has been installed and a start has been made on the plywood ceiling. Fresh water system is working and we can soon start on the galley. Several of us slept aboard while everyone was here for Christmas. Our pint-sized crew spent hours playing on the boat, shouting, "ahoy, matey" and "aye-aye, Cap'n" at each other. As promised - some cabinetry for the galley. Next project is the plumbing. One happy boat-camper! The propane is hooked up to our secondhand stove, and it works! Now we wonder if the little on-demand water heater will work after having been ignored for so long. But it's now installed, awaiting only some minor plumbing, we hope, Maybe we will be able to demonstrate a nice hot shower tomorrow, and then, we might take this Taj Ma Boat on a more luxurious adventure than prior ones have been. We had her out a number of times this summer, day trips across the Albemarle Sound to lunch, to a party, and with the World's Cutest Granddaughter and friend, to visit a little town on the Roanoke River. Unfortunately, Plymouth was closed that day, I had forgotten about tiny towns and Wednesday afternoons. The trip past the thickly wooded river banks was lovely, though. One outing was about four hours northeast to the Albemarle Plantation, a nice gated golfing community with all the amenities imaginable.. The Spook, our ship's cat, was along for the fine smooth ride, perched on the forward cabinetry, proudly gazing out the window as if he owned not only the houseboat, but the entire vast sound. We pulled into the Plantation's dock, met friends for dinner, and spent a moonlit night with waves slapping gently on the hull. The next morning, I had a meeting there, and Rob puttered around on the boat, By lunchtime, we were ready to head for home, fueled up with no-ethanol gas. The dockmaster couldn't let us go until he had told us about all the comments from the inmates. "I musta fielded twenty calls this mornin' from people wanting to know, ''What th' hell is THAT thing?" Our ride home was a'rockin' and a'rollin' in waves kicked up in the fresh breeze. The Spook was nowhere to be seen. As we turned into Edenton Bay, he peeked out from under the settee cushions, relieved to find things more to his liking. Some visible progress this summer. Window trim and ceiling panels.